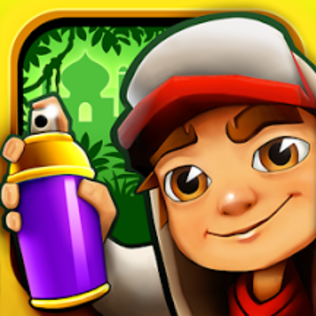 If you use Android, iOS, Windows 8 and Amazon Kindle you will know or came across Subway surf. 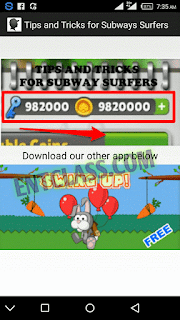 Subway surf is an addictive and endless game which many Android users have in their respective phones today. Even little children of nowadays plays Subway surf and i can tell you that this game is nice to play and has a good graphics places to run. 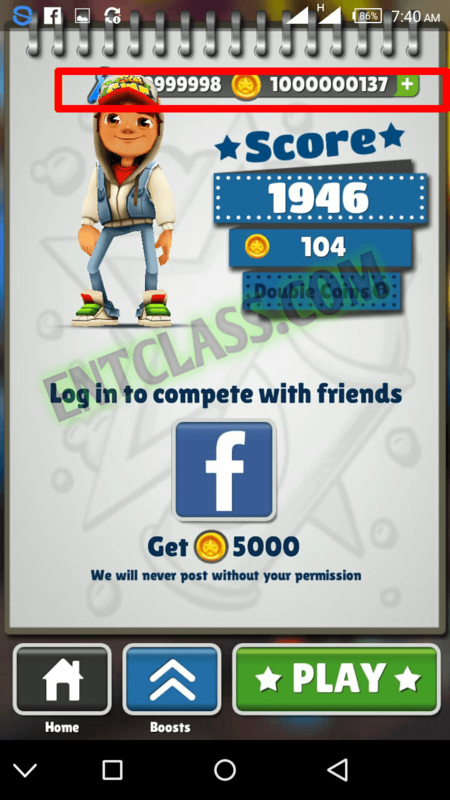 Many subway surfers have stopped by the way and some even quited due to low coins and keys. Today, Victor Kachi is here to get you back on track and also amaze your friends and make them say "Wow, how did you do it". 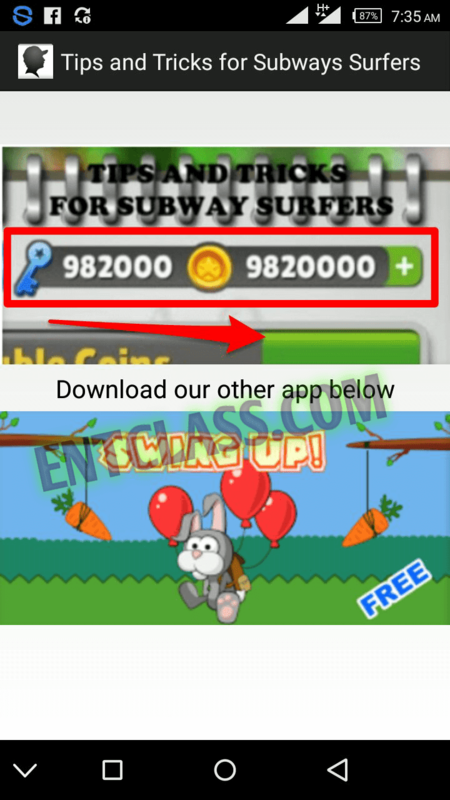 I'm going to drop a tutorial here on this blog Entclass.com on how you can get unlimited Subway surf Coins and Keys so you can unlock everything in the game and last as long as possible. After this tutorial, you gonna thank me. Trust me. Before i continue, kindly see the screenshot i took while playing - (If you are doubting me, i hope you can see the screenshot below). With these coins you can buy many appearance and change your look. With unlimited keys, you will have unlimited life. Now let's get to what we are waiting for. First thing you need to do is to Goto Settings in your phone, then App. You would see all your apps, scroll down till you see Subway Surf then tap on it. 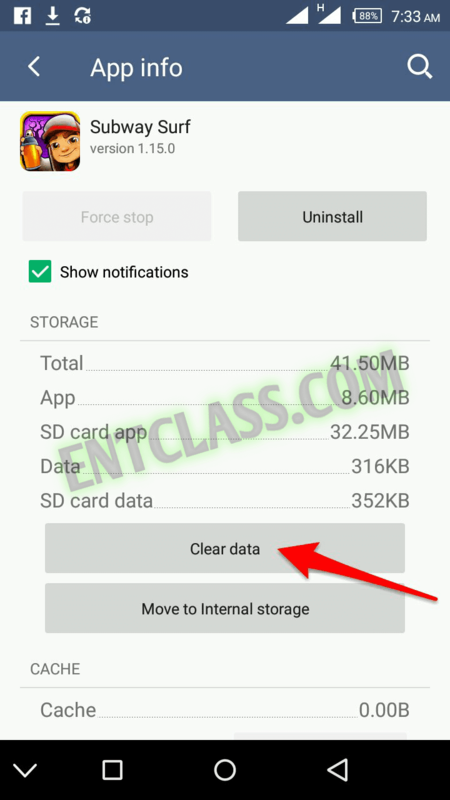 Now launch the downloaded "Tips and Tricks for Subway Surf Entclass.com.apk"
Tap on the Green button as seen in my below screenshot. Next is to tap on APPLY on the next page that shows. Read the message with Red letters then Tap on close App. Open your subway surf and enjoy, get crazy high scores and show off to your friends. Don't be stingy, refer your friends here on Entclass.com if they asked you "How did you do it". Appreciate me by sharing this post using the available share buttons below. Kindly comment if you are confused. I ain't sure if you followed my steps carefully. Or probably you don't understand how it works. Cos it's confirmed before posting. =)) Like seriously, i have unlimited keys and coins now. I noticed it working for that version. nah oh...minez 1.58.0...any idea hw ican get ur above mentioned version? Scroll down till you see v1.15.0 then click the download button.